Gathering and clipping was often done on a communal basis, all the farms for one area of fell joining together to do the job. The womenfolk backed up the men with tea and home made bread, cakes and jam, and if they had time they also rolled the fleeces for packing into the woolsheets. Rolling a fleece is an art. 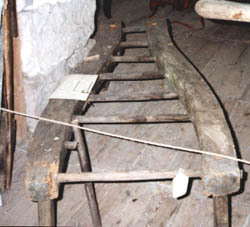 It is rolled inside out, edges to middle, then tail to head, and tied round with a band of wool roughly twisted from the neck area. This keeps the fleece together in transit, packed in the wool sheet. A modern wool sheet will hold around 50 fleeces, depending on the size of the sheep; from larger breeds such as the Border Leicester or the Greyfaced (Mule) cross, perhaps 35 fleeces to a sheet. The clipping stool was one way of easing the strain on the men's backs during the summer burst of work. The shearer sat on the narrow end, and the sheep was brought to him by a catcher and deposited on the broader one. This brought her up to the shearer's level.